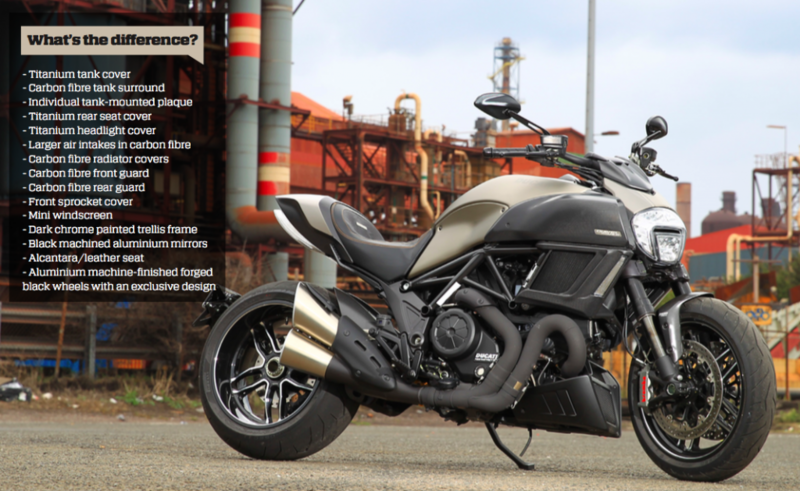 It’s difficult to put a finger on just who Ducati’s Diavel muscle cruiser is aimed at. Since its release in 2011 I have watched the number of Diavels on our roads steadily grow, and made note of the wide variety of riders enjoying the booming beastie. I have spied old and young from both sexes enjoying the torque-filled riding experience of the big V-twin – which is great news for the Ducati marketing department. 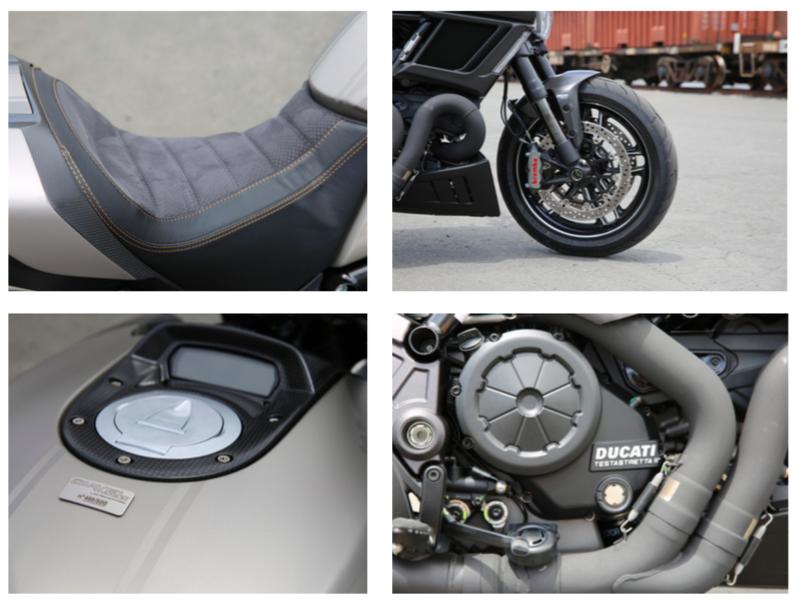 While the Bologna-based motorcycle manufacturer worked on the XDiavel in secret, it released a limited run of 500 more muscular, limited edition Diavels cloaked in the exotic aerospace metal titanium. When unit number 496 arrived on our shores, Australian Ducati importer Fraser Motorcycles asked if we would like to have the rare machine parked at Gassit HQ for a couple of weeks. How could we say no. If you are unfamiliar with Ducati’s Diavel, welcome back from your half decade living on another planet – this is what you have missed. One day Ducati decided to take its rampant 1198 Superbike engine and engineer a bit more user-friendliness into it. This included decreasing the valve overlap from around 41º to just 11º. Doing so blessed the engine with lashings of usable midrange grunt and the mill was christened the Testastretta 11º engine. It was then shoehorned into a trellis chassis and given styling so unique it struggled to fit into any existing segment: part sportsbike, part cruiser and a whole lot of attitude, all topped with a super-fat 240 rear tyre. 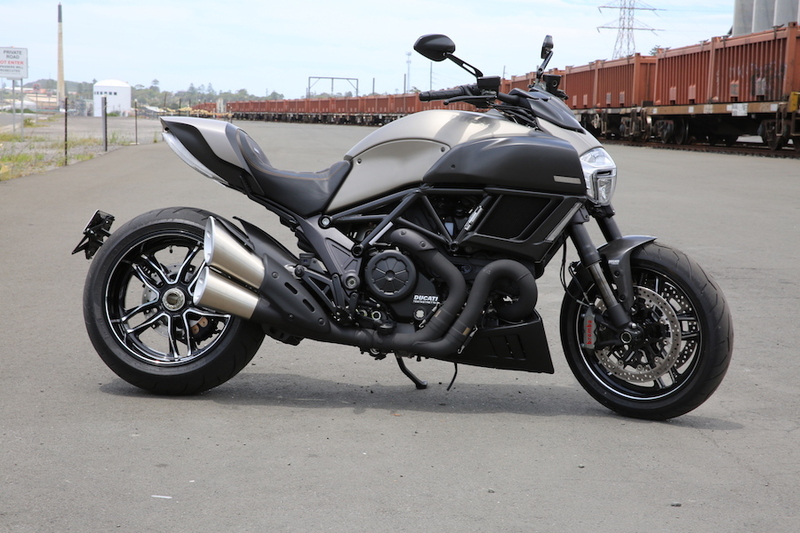 Changes to the Diavel since its release in 2011 have been limited, with the 2015 second-gen model featuring slight engine modifications, handlebar risers, new exhaust cans and headlight, plus minor cosmetic tweaks. Over the past five years Ducati has also released a handful of special edition versions including the Diavel Carbon and the Titanium. The radiator covers, micro windscreen, front and rear mudguards, front sprocket cover and filler cap surround are all carbon fibre jobbies. It may not have the silhouette of a MotoGP racer, but there’s enough exotic material splashed around to do a bloody good impersonation. The exhaust pipes – I prefer the term musical instruments – have a high-grade Zircotech black ceramic coating finished off with brushed stainless steel, and contrast the dark titanium beautifully. The black mirrors machined from solid aluminium round out the list of ostentatious touches. While these changes alone would be enough to differentiate the Diavel Titanium from its commoner siblings, there are two other touches that will ensure even those with only a passing interest in motorcycles pick it as something special. First, the big muscle cruiser runs a gorgeous pair of machine-finished wheels forged from lightweight aluminium (3.5 x 17 front and 8 x 17 rear). The deep dish rear fitted with a super fat 240-section tyre hangs off the single-side swingarm like the mag wheel of an exotic European supercar. However, the wheels are not the bike’s crowning glory. That title belongs to the redesigned air intakes, which are considerably wider than the standard model, giving the bike broad powerful shoulders. I wouldn’t have believed the Diavel could be made more muscular unless I saw it with my own eyes, but Ducati has achieved it. From the cockpit the bike looks and feels a great deal brawnier, though it still handles and stops as superbly as you would expect from a Diavel. One thing that did catch me by surprise was the stiffness of the seat. My arse quickly informed my brain that the design was slightly different, possibly incorporating harder padding to allow for the hand-stitched Alcantara. At first I thought someone had been playing with the fully adjustable front and rear Marzocchi / Sachs suspension. Despite the Diavel having an ample 120mm travel at both ends, most bumps in the road were felt with the standard shock settings. I stopped twice to adjust the suspension before settling on something on the soft side of the ledger. I wasn’t going to be attacking any racetracks so I was quite happy to have the rear set soft for the road, and it made for a much less tiring ride. Apart from the bling, the bike remains unchanged from the standard Diavel with three ride-by-wire modes: Urban, Touring and Sport. This time I did get to try the the power reduced Urban (rain) mode courtesy of a not so enjoyable ride in torrential rain. Interestingly, I found Touring remained my favourite mode in the wet as well as in the dry. While the Diavel has a lot of power and torque on tap (119kW and 130.5Nm to be exact) the bike is easy to keep in line, even in treacherous conditions – it all comes down to how much you want to twist your right hand. The ABS equipped radial mounted four-piston Brembo Monobloc calipers handled the wet and dry running with ease. However, it’s not perfect – no motorcycle is. 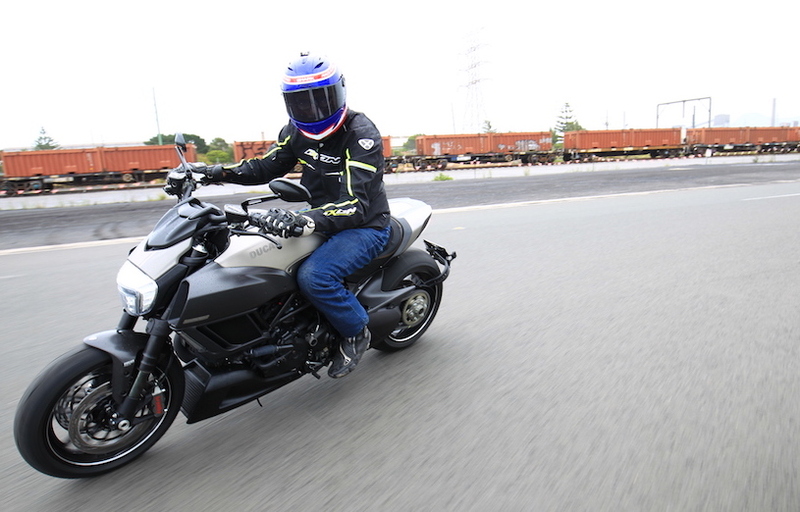 The Diavel is very much a cruiser and not a tourer. While there’s oodles of torque on tap to ensure you can blast from a standstill to the speed limit, and beyond, with consummate ease, staying there is exhausting. The riding position is upright and exposed, meaning your whole body becomes a giant windsock. The faster you go, the more the force of the wind wants to rip your hands from the grips. Of course, I am 184cm tall and talking about freeway speeds, and there’s nothing more boring than riding on a freeway – they are best avoided. 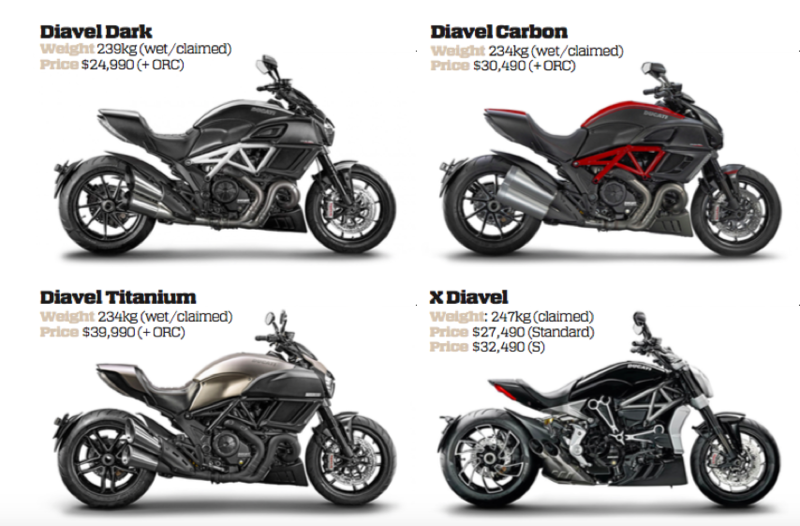 I suppose the number of Diavel Titanium models sold will come down to one question: why would anyone want to part with an additional $15K for a bike which is pretty much the same as the base model with some titanium, carbon fibre and aluminium machined bits splashed around? For the answer, look no further than yours truly. If I was going to own something as ‘in your face’ as a Ducati Diavel, I would happily spend the extra money to have one that was more ‘in your face’ than any of the others. I’d buy it to know that as I cruise toward my favourite riding spot there will only be the smallest of chances I will see someone riding the same bike, and it won’t be exactly the same anyway – the plaque mounted on my tank will have a unique number, making it a unique bike. It’s all stuff that makes it worth the extra investment. Yes, deep down inside I really am quite shallow. 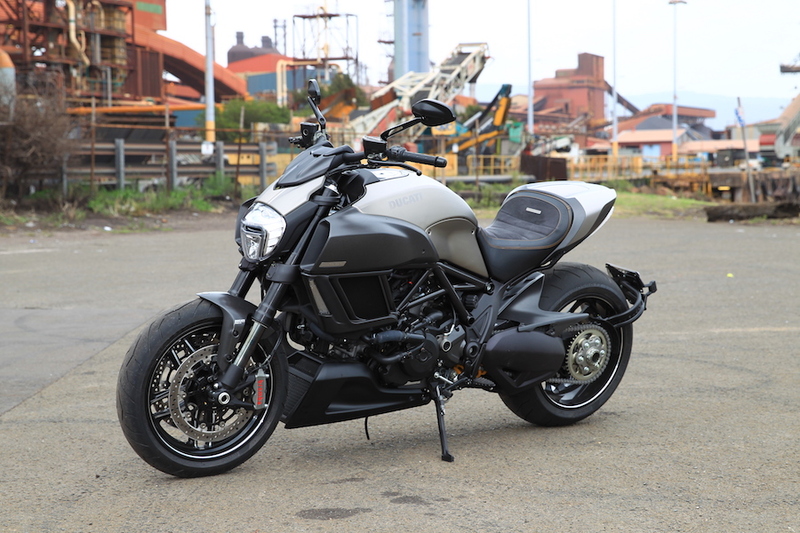 The original Diavel was released in November 2010 as a 2011 model. The engine is a retuned version of the 1198.4 cc (73.13 cu in) Testastretta from the 1198 superbike, renamed the Testastretta 11° for its 11° valve overlap (reduced from 41°). The uniquely styled bike was the brainchild of Pierre Terblanche, who eventually left Ducati to take up a position with Confederate before moving on to Royal Enfield. When Ducati’s XDiavel and XDiavel S arrive in February the Diavel family will grow to five models.